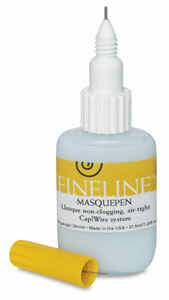 Masking is a breeze with Masquepen! It's as easy to use and as precise as a pen for the ultimate in user control, which means less waste and more value for your money. Draw thick, thin, straight lines, or curves. The pale blue water-based latex solution is easy to see, apply, and peels away from paper like a charm. Large Set — This set includes everything in the Small Set, with the addition of a Masquepen refill. Small Set — This set includes one Masquepen and one ultra-fine 0.5 mm Supernib Masquepen for precision work. It comes with a cleaning system with a solid needle for pushing out excess masque. Supernib Masquepen — Use this Masquepen for ultra-fine work. The Supernib has a 0.5 mm tip for precision. It includes the Supernib needle attachment.